This mosaic interpretation of the city of Bordeaux’s shield of arms can be seen in the Parc Floral and is one of many designs to be spotted throughout the city. But what do its various components represent? Let’s work our way down from the top. The blazon is topped off by an azure segment comprising the distinctive silhouette of the fleur de lys, the stylised lily which was the symbol of French royalty. As we shall see further down the page, this part of the coat of arms has not always featured! Below the fleurs de lys is a lion, a remnant of the years the city spent under British rule from 1154 - when Eleanor of Aquitaine married Henry, Duke of Normandy, later Henry II of England - until 1453 and the Battle of Castillon which marked the end of the Hundred Years’ War. The fortifications represent the medieval-period city hall, or hôtel de ville, of which all that remains today is the gate, its two middle towers and central look-out: this is Porte Saint-Éloi, one of the main gates into historic Bordeaux, and its famous bell, la Grosse Cloche (which, unusually, is not clearly depicted on the mosaic design above). We finish up with the blue waters of the Garonne (although surely brown would be more accurate), overlaid with a crescent, which represents the shape of the river as it flows through the city… hence Bordeaux’s nickname: le Port de la Lune. Depictions of the city's shield of arms on the walls of Hôpital Saint-André (note the copious amounts of fruit), the Camille Godard monument in the Parc Bordelais, and outside today's city hall, Palais Rohan. It might then be noted that when the city was under British rule, the shield of arms featured not one but England’s distinctive three lions, which can still be seen on the Royal coat of arms of the United Kingdom (and the shirts of the England football team). 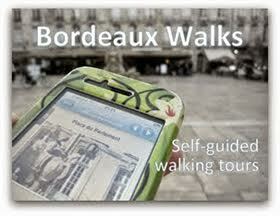 Two famous examples of Bordeaux’s three lions (minus, of course, the fleurs de lys!) can be seen in the Musée d’Aquitaine. 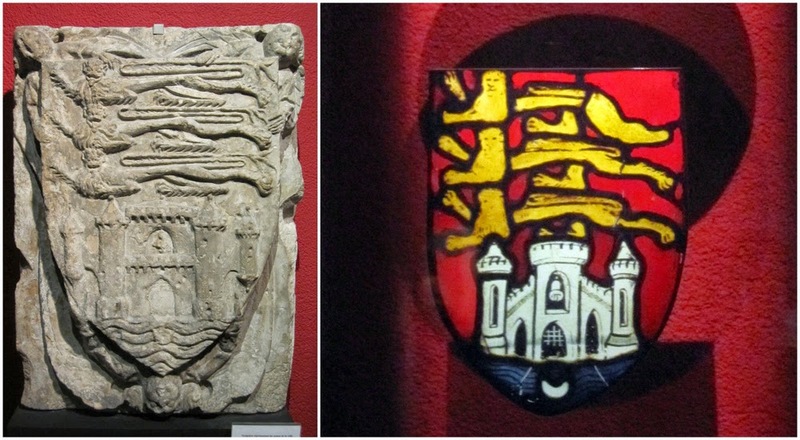 On the left is a limestone sculpture from the late 15th-early 16th century, while on the right is a 15th-century stained-glass portrayal which was originally in the Notre-Dame-de-la-Rose chapel within Saint-Seurin basilica. 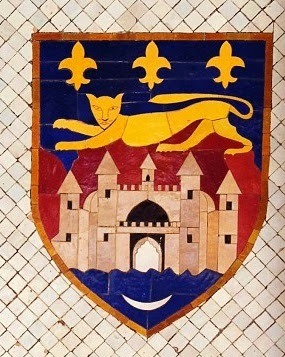 Sometimes, as can be seen further up the page, the shield is augmented by a mural crown, symbolising the city's status as departmental capital. The full “achievement”, as can be seen below, also comprises antelopes in chains, the chains attached to crowns around their necks which, again, feature the fleur de lys design. If anyone can shed any light as to what that is all about, I’m all ears. Completist designs such as this even include the city’s royalist motto, the full version of which is: “Lilia sola regunt lunam unda castra leonem” or “the lilies alone reign over the moon, the waves, the fortress and the lion”, i.e. a single-sentence Latin description of the shield of arms itself! This elaborate design, featuring shortened motto, can be seen on the walls of what is now Collège Francisco Goya (rue du Commandant Arnould). 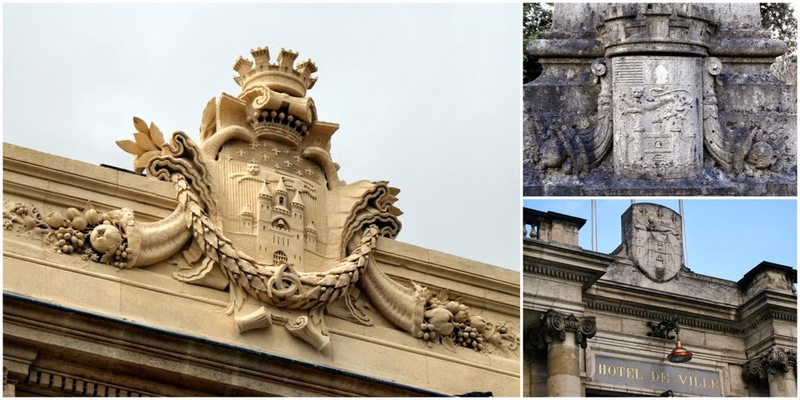 From the middle of the 17th century onwards, the crescent was extracted from the shield of arms, multiplied by three and began to be used as a standalone emblem of the city – in this modern day and age it is regarded as the logo of Bordeaux! As can be seen below with the “floating” crescents, there may have been a few years of fine-tuning: the “borne de jurisdiction” pictured is one of several dotted around the city’s suburbs (this one can be seen in the grounds of Château Lescombes in Eysines). At one time stones like this marked the boundaries of the suburbs of Bordeaux. 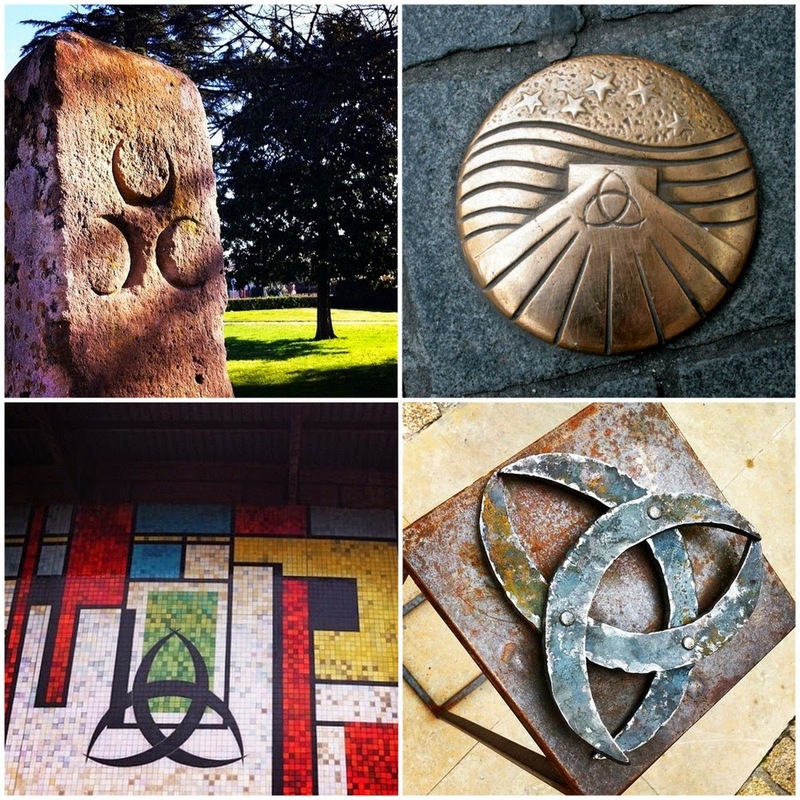 The treble-crescent emblem in Eysines (in an embryonic form), on a marker for Saint James' Way pilgrims, on the walls of the Grand Parc Salle des Fêtes and at a crafts fair in Cour Mably. 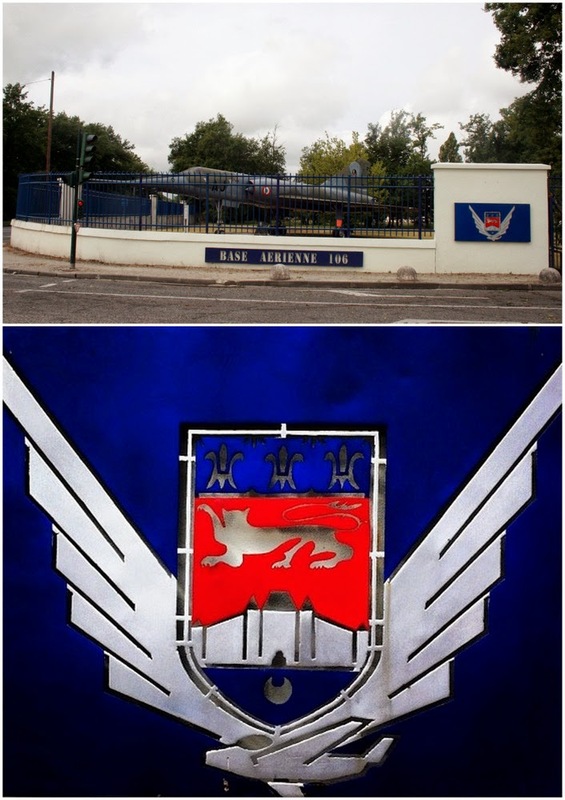 And, to finish off, let’s stay in the suburbs for this, one of my personal favourites when it comes to interpretations of the Bordeaux shield of arms: it can be seen outside the BA106 military air base in the Beutre district of Mérignac, and is a modern, minimalist take on the ancient designs. But instead of the antilopes we have wide wings and... carrying the full weight of the city is a small military aircraft! 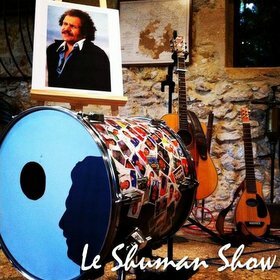 Thanks to Antoine Puentès, AKA MystickTroy, for providing useful information! You were asking about the 2 «horses» left and right of the shield. You will find some example of those, even if i'm not sure about Scotland being present in Aquitaine. Good job for you site! Maybe because he was the reigning king at the time Bordeaux was taken back by the French? Thanks for that feedback. Indeed, there are lots of parallels between the Bordeaux coat of arms and British equivalents!